In-outdoor work in the large power tools requiring large output. -Equipped with sine wave inverter to output high-quality electric commercial power of. -Simultaneous V single phase 100V/200V output possible. Single-phase 200 V electrical products are available. 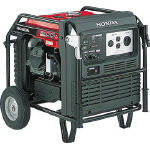 -Equipped with generators driving state you can see at a glance [I-monitor].